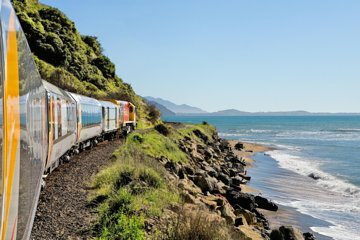 The Coastal Pacific is one of the ‘Great Journeys of New Zealand’—a scenic train route that runs between Picton and Christchurch on the South Island. On this tour, enjoy a hassle-free experience with prepaid tickets and soak up the scenery on the 5-hour one-way journey. Along the way, listen to the audio commentary, order refreshments from the on-board café (own expense), and admire views of the Pacific Coast, Kaikoura, and Canterbury Plains.